This section describes the high availability configuration of ILB using the DSR, half-NAT, and full-NAT topologies. This section describes how to set up the ILB connections to achieve high availability (HA) by using the DSR topology. You need to set up two load balancers, one as the primary load balancer and the other as the standby load balancer. If the primary load balancer fails, the standby load balancer assumes the role of the primary load balancer. The following figure shows the DSR topology for configuring the ILB connections to achieve HA. Make sure that all server have VIP configured on their lo0 interface. 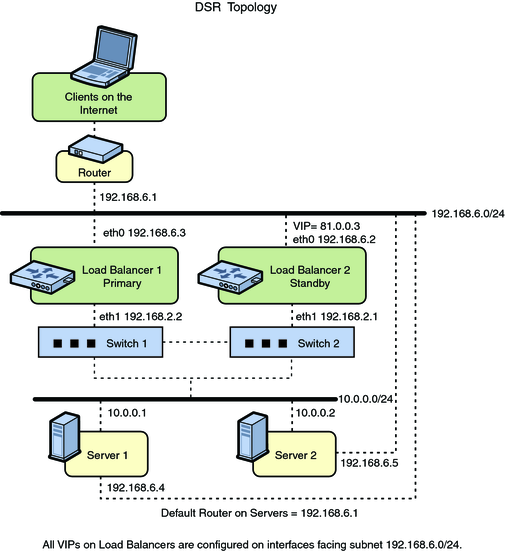 Configure Load Balancer 1 to serve as the primary load balancer. Configure Load Balancer 2 to act as the stand by load balancer. If Load Balancer 1 fails, Load Balancer 2 becomes the primary, takes over address resolution for the VIP 81.0.0.3, and handles all the packets from clients with the destination IP address 81.0.0.3. When Load Balancer 1 recovers, Load Balancer 2 returns to the standby mode. If one or both of the Load Balancer 1's interfaces fails, Load Balancer 2 takes over as the primary. Thus, the Load Balancer 2 takes over address resolution for VIP 81.0.0.3 and handles all the packets from clients with the destination IP address 81.0.0.3. When both of Load Balancer 1's interfaces are healthy, Load Balancer 2 returns to the standby mode. This section describes how to set up the ILB connections to achieve HA by using the half-NAT topology. You need to set up two load balancers, one as the primary and the other as the stand by. If the primary load balancer fails, the standby load balancer assumes the role of the primary load balancer. The following figure shows the half-NAT topology for configuring the ILB connections to achieve HA. Configure both the primary and standby load balancers. 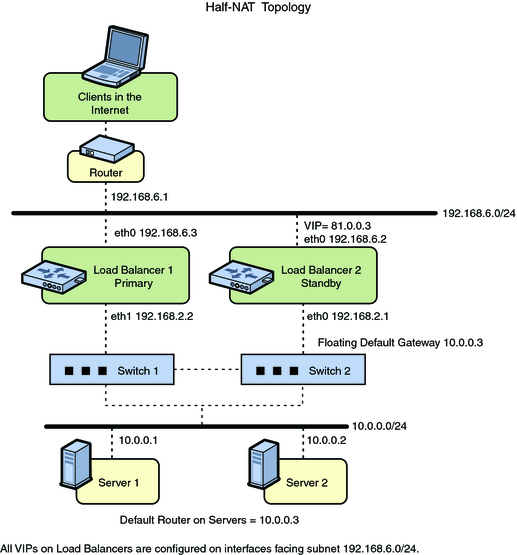 Configure the Load Balancer 2 to serve as the stand by load balancer. Add the IP address for the floating default gateway to both servers. If Load Balancer 1 fails, Load Balancer 2 will become the primary and take over address resolution for the VIP 81.0.0.3 and handle all the packets from clients with the destination IP address 81.0.0.3. It should also handle all the packets that are sent to the floating gateway address 10.0.0.3. When Load Balancer 1 recovers, Load Balancer 2 will return to the standby mode. If one or both of Load Balancer 1's interfaces fails, Load Balancer 2 will take over as primary. Thus Load Balancer 2 takes over address resolution for VIP 81.0.0.3 and handles all packets from clients with the destination IP address 81.0.0.3. It should also handle all the packets destined to the floating gateway address 10.0.0.3. When both Load Balancer 1's interfaces are healthy, Load Balancer 2 returns to the standby mode. Note - The current implementation of ILB does not synchronize primary and standby load balancers. When the primary load balancer fails and the standby load balancer takes over, the existing connections will fail. However, HA without synchronization is still valuable under circumstances when the primary load balancer fails.